There are three major body types – ectomorphs, mesomorphs and endomorphs. All of them are unique, and it’s their structure and metabolic processes that make them unique. This means that all of them react differently under stimulus and that means they all react somewhat differently to various exercises. Each body type has a number of exercises that work best for it, so let’s delve deeper into the mysteries of the human body. Ectomorphs find it incredibly difficult to gain any muscle mass at all. They have really low body fat and they look amazing, without the need to cut to have great definition even when they’re getting bloated on junk food. However, it is still possible to add muscle mass if you’re an ectomorph, but it’s incredibly difficult to do so. If you can’t put on muscle, your exercises should be basic compound movements that will give your body no choice but to adapt and overcome. This means you should use heavy weight that will activate a number of muscle groups at the same time, both major and minor ones. Here are five exercises specifically for ectomorphs. 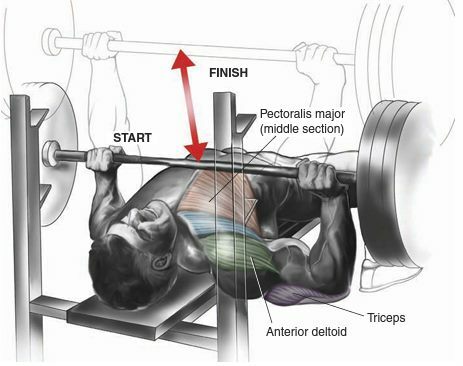 For over 70 years the flat barbell bench press has justifiably been the ultimate upper-body exercise. It activates all of the muscles in your upper body that can push upwards, and those are the anterior deltoids, pectorals and triceps, in one swift motion. Also, use a barbell instead of a machine or dumbbells, simply because it’s one piece instead of multiple independent pieces of equipment. When you put a lot of weight on it, you want it to be easier to handle, right? This is exactly the reason behind your inability to bench two 100lb dumbbells for 10 reps, when you are certain you can bench a 200lb barbell for the same number of reps. If you stress your muscles more, they will grow more, so you can also put a lot of weight on a machine, even more than you can lift on a barbell. However, machines don’t need your core to be recruited into the movement and balance and coordination is not a problem. This is problematic because that balance and core activation is needed, and your upper body muscles will still develop as much as they can with the barbell. They activate every single muscle below the belt, and that means the quads, glutes, hamstrings and calves. Squats are the ultimate lower-body exercise, but a lot of people may wonder why they shouldn’t do leg presses instead of them – it’s the same dilemma as it was in the previous exercise. The answer lies in the difficulty of the exercise, and with squats being much harder to do than leg presses, which don’t really affect stabilization nor do they activate your upper body strength. You can put 320 pounds on a barbell and do one squat, but you can also load up 700 to 800 pounds on leg presses, but the squat will still benefit you more, since it will activate all of your lower body muscles including your core. You’ll need a lot of power to get down, pick up a barbell and come up with it on your back, and it’ll be good for you. If you’re looking for an exercise that activates all of your body’s muscle, the deadlift is the closest thing that exists. When you begin the exercise, you’re doing a squat with the barbell in your hands and in front instead of on your shoulders. That makes a difference in the way that weight is distributed, which in turn makes your entire back activate for the movement. 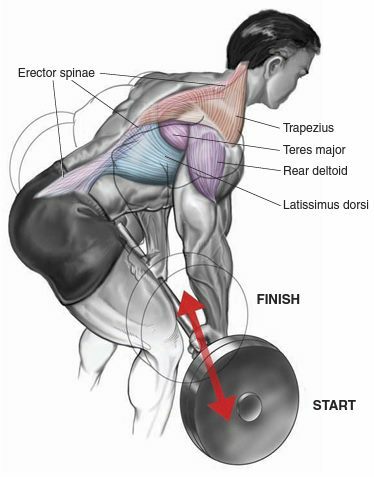 This means that everything from the traps, lats and all the way to the spinal erectors is recruited for the movement. Not only do these muscles tighten and therefore stabilize the barbell in your hands as you go up, but they also help with the heavy lift when your bar goes above your knees. The deadlift is an exercise that allows you to lift the most, meaning it’s the exercise that lets you put on most weight on it, so people love to do it and they should – it’s a good exercise for everyone that wants to pack on as much muscle mass as they can. If you’re an ectomorph, your shoulders are probably pretty narrow, so you would want to make them bigger as quickly and as effectively as possible. When you want to do that, there is one exercise that you can’t pass up – the seating barbell military presses. It’s the same like with the barbell bench press, you still need to work on your balance and arm coordination, but you can put a lot of weight on it which means that you’ll lift more and therefore have a greater effect. This is the ultimate shoulder exercise for getting lean. Ectomorphs also have thinner backs, and the remedy to that is a good workout of barbell rows. This exercise activates your lats as you try to defy gravity and pull that weight towards you, while being bent over. And remember – barbells are better than dumbbells, cables and machines with its superior stimulation effect on the muscles. All of the body types have good and bad sides. Ectomorphs can lose weight really easily, but they can’t gain any mass, but the endomorphs have it the other way around – they can get big effortlessly, but they can’t drop weight and keep lean. When endomorphs want to create a body that also looks good, they run into a structural issue – their bodies are prevalently pear shaped with big waists and hips and small shoulders. Since the conventional aesthetically pleasing body has V-tapers which is the opposite of endomorph physiques, people with this body type need to customize their workout routines in order to make their backs wider and their shoulders bigger, all while making sure to reduce the involvement of the core and upper legs to reduce the size of the hips and make the waist narrower. Here are the exercises that endomorphs need. When you want to widen your shoulders, you should try to increase your medial deltoids, which can be done with lateral raises. You can try a combination of lateral raises for all of your shoulder workouts – a set of dumbbell raises and another set of machine or cable raises. Also, you should try to tack on a few more sets of lateral raises after every complementary workout in your week, like when you’re doing chest day. If you do that, your shoulder muscles will be ready because of their engagement with heavy presses, which means they will reap the full rewards of the extra lateral raises performed. Normal squats are an awesome exercise, but endomorphs might have problems with them because the regular back squat activates the glutes and hip flexors, which you certainly do not need to develop if you’re an endomorph and want to look good. In order to lose this negative effect but keep the positive one, do your squats in the front. This way you’ll put more pressure on your quads and you can be certain the middle of your X-frame won’t blow out. This is an exercise that aims to put a lot of muscle mass on your body, which means that it has priority over flat barbell bench presses. The inclined benches have, of course, an angle which assists you in thickening up your chest to match your wide shoulders. However, the only way to do this is by doing a lot of heavy lifting, so get on the barbell. Getting your lats to a sufficient level might seem like a job for barbell rows, but there’s a huge problem there – you will need the right posture and to not hurt your lower back, although this exercise has an effect on the core, which you definitely don’t want. You don’t need to make your midsection thicker, quite the contrary. As you know, the endomorph body type is thick-waisted, which means that the barbell rows aren’t acceptable for this goal. Instead, do some single-arm dumbbell rows. They will isolate your lats but you’ll have a lot of leverage when you support yourself on that bench, meaning you won’t be working on the core muscles. If you want to go to an extreme to remove your core from the action and make sure that you’re only doing lat contractions, lie down on an incline bench and do single or double armed dumbbell rows. If you want to build your upper back, you want to do wide-grip chin-ups. You want to have a wide grip because it adds to the size of the back but also because it widens it – this is normally an exercise performed with your own weight, so the muscles on your upper back will be recruited into the motion. However, there are a lot of people that can’t even do a single chin-up because they aren’t strong enough, they weigh a lot or a combination of the two – these people can try to vary some aspects of this exercise and still use it to benefit their form. The wide-grip chin-up is right besides the underhand lat pull-downs and the assisted chin-up machine – they will all help you widen your back bit by bit, so get lifting! Mesomorphs have won the genetic lottery, which means that literally any type of exercise that pushes them to their limits will make them look great. They do have some problems but they can be solved with a good look at their workout routine. Here are a few exercises for the classic mesomorph body types. Even if you have a great body, it’s very likely that your bottom chest is far more developed than your upper chest. 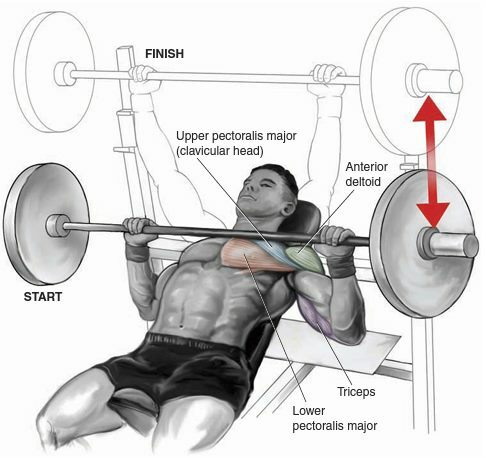 Incline barbell presses will benefit you, but a lot of people can’t activate their upper pectoral muscles, which means that the front deltoids will have to take on a lot of work. When you lift dumbbells, you can better target the upper pectorals and focus better on the exercise which in turn enhances the connection between your mind and the muscles you’re working on. The one “drawback” is that your muscles will need to provide assistance with balance and coordination, but they will also give you a far bigger range as opposed to working out with a bar. Dumbbells will also let you contract your muscles with more intensity. Your legs should be looked after just like every other body part and lately more and more people have been neglecting them. If you look at the people who worked on their legs with enough dedication, not many of them possess the famed outer quad sweep that gives you that form of a defined lower body. When you want to make your outer quads bigger, and especially your vastus lateralis, you need hack squats. They can hurt your knees, so make sure to not over-do it. No going extra heavy or incredibly deep. You need to be lifting something that you can effectively bring to parallel in 12 to 15 reps. When your knees get stronger, go bigger, but not until then. Having big frontal deltoids isn’t a rare thing to see, but the side deltoids are far more prized. 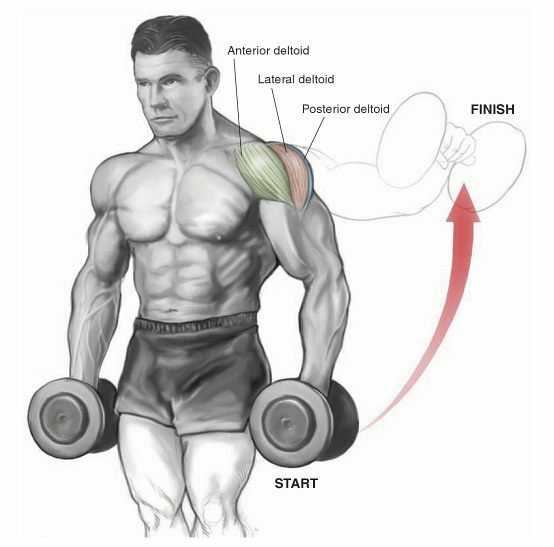 There are only a small number of lifters that have rear deltoids anywhere near the size of the other two shoulder heads. If you don’t work on your rear deltoids with consistency, you can’t develop them, and we all know that we put them at the end of the workouts when you can barely do them with proper form and intensity. To remedy this, do some rear dumbbell lateral raises to activate your rear deltoids. Do as many sets as you would do with front and side raises. This exercise doesn’t need to be pushed off to the end of the workout, if you want to work on a muscle, do it when you’re full of energy and concentrated enough to get it done. In order to have a good-looking physique, you need to bolster your quads and hamstrings. While the former isn’t really seen every day, the latter is even rarer! You probably do your hamstring exercises after doing an hour of quads, which exhausts them, and at the very end you just do a few lying leg curls that are rarely performed with the adequate intensity. 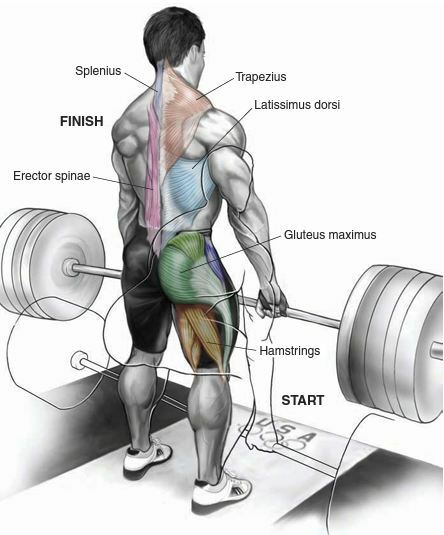 Do Romanian deadlifts with a barbell to help your quest of having great legs. Bend your knee a little bit and your hamstrings will start looking better. When you’re doing a leg day, do your Romanian deadlifts first, or do them on a completely different day when they won’t be done after quads. These muscles are probably even harder to develop than hamstrings. Not many exist and they are usually good-looking because of genetic luck, but you can always do low insertions to boost them. You just need to be honest with yourself as to why your calves aren’t that perfect – it’s because we all fail sometimes because of neglect and insufficient training. You can’t make your calves look good with a few sets of standing calf raises. All standing exercises activate the gastrocnemius, which is a muscle in the shape of a diamond that you can see from the outside of your calf, but if you really want to improve them, do some work on the soleus muscle which resembles a spade shape. It’s located right under the gastrocnemius and you can train it with your knees fully bent, like when you’re doing a seated calf raise. Put some really heavy sets in your workout schedule with 15-20 reps each, as well as standing calf raises and some toe presses which you can do on a leg press. To develop your calves necessitates the same priority as developing your rear deltoids – make them your primary objective and you’ll get there. Those are the five best exercises for all three body types. No matter what body type you have, you can always make it better by just using certain specific exercises. ← 12 Home Exercises For Effective Fat Burning.